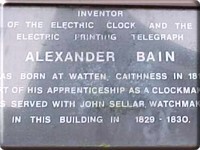 Born in Watten, Caithness, to a cotter's family, Bain did not excel in schooling so instead apprenticed as a clock-maker in Wick. He went to London in 1837 to work as a journeyman, and soon set up his own workshop on Hanover Street. By 1840, Bain's workshop was cluttered with models of proposed inventions but he lacked the finances to develop them further. 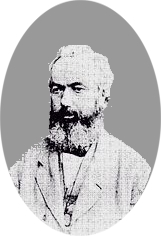 He sought help from English scientist and inventor Sir Charles Wheatstone, to whom the editor at Mechanics Magazine had introduced Bain. 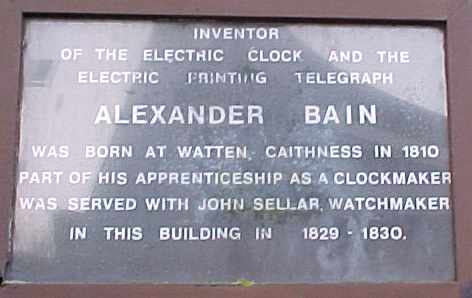 Bain demonstrated his model of an electric clock to Wheatstone, who, however, discouraged Bain from pursuing its development any further. Three months later, Wheatstone presented Bain's electric clock to the Royal Society as his own invention. Bain, however, had already applied for a patent, which Wheatstone failed to block despite his great effort. When Wheatstone sought to establish the Electric Telegraph Company soon after, the House of Lords compelled him to compensate Bain ten thousand pounds and give him a managerial position within the company. Bain's first patent for the electric clock was awarded 11 January 1841. The patent described a pendulum kept in motion by electromagnetic impulses, which Bain later improved by adding an "earth battery" (zinc and copper plates buried in soil) to conduct electricity. Bain's clock led him to the facsimile machine in 1843. He used a clock to synchronize two pendulums for line-by-line message scanning. For transmission of the message, Bain put metal pins on a cylinder made of insulating material. These pins were then scanned by an electric probe that transmitted on-off impulses. The message was reproduced on the receiving end of the line on electrochemically-sensitive paper. 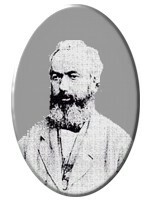 English physicist Frederick Bakewell, however, improved Bain's design and beat him to the patent office for an "image telegraph" by two years. But although the chemical telegraph was much more efficient than the mechanical one, it never achieved widespread usage. Samuel Morse obtained an injunction on Bain's invention in the 1850s on the grounds that the paper tape and alphabet used fell under his own patent. 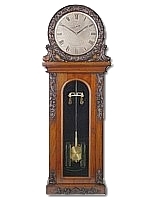 One of Bain's first electrical pendulum clocks can be seen on display at the German Watch and Clock Museum in Furtwangen in Schwarzwald, Germany.